The Place Located at the revamped, or rather still-revamping Centrepoint along Orchard Road, sits Souper Tang‘s first outlet in Singapore. Having opened its first restaurant in Johor Bahru in 2009, the group has since expanded to 18 outlets across Malaysia, with the Centrepoint branch being their first overseas venture. Tucked at the corner of the second level, the shop spots an open-concept layout with classy finishings to complete the wholesome experience of enjoying the herbal soups here. The family has been in the business of Chinese medical hall prior to their restaurant venture, and is well-versed with the nutritional benefits of herbs and diners’ palate preferences when it comes to brewing their pot of soups. And yes, if you like any of their soup, feel free to buy the nicely packed Chinese herbs at the merchandise section and you can attempt to replicate these at home too! The Food You simply have to start with their most popular Souper Tang Signature Soup ($26.90 for two, $39.90 for four). Once the lid is lifted, the ginseng aroma will strike you promptly, yet not overpowering when you take the first sip. All soups here are brewed off a base soup which remains a “secret” recipe to the owners, all we know is that the base takes hours of preparation before ingredients for each of the specialty soups are added. For their signature soup, dried scallop, mushrooms, American ginseng, ginseng root, fish maw, chicken and pork belly are added, the soup remains light despite the myriad of elements. Best taken during a rainy day, like any good soup should be, and here’s one. Another soup, the Shi Quan Spare Ribs Soup ($13.90) is served in individual pots, just like all other soups on the menu except their signature soup. Well, if you have had any thing Shi Quan before, you will know the slightly bitter after taste of the herbs. Surprisingly, the Shi Quan soup here had a sweet undertone which balances well with the herbs, making this soup almost perfect – a testament that not all medicinal soups has to be bitter! And yes, the tender spare ribs makes this soup even better – I will have this again! Souper Tang is not all about Soups, do order some of their signature items on the menu to go with your soup to complete the meal. Instead of having rice, make very sure you order my favourite here, such as the Mee Suah tossed in Abalone Sauce ($3.90). Very simple staple here, but so delish, you might just order a second serving while you are at it. Slightly oily texture, likely due to homemade XO sauce, with flavours enhanced with the abalone sauce. Strongly encourage you to have the mee suah together with the Home Braised Pork in Rich Dark Sauce ($18.90) and Stewed Chicken Coryceps Flower and Essence of Chicken ($19.90). The braised pork, served on a hot plate, was tender, very well marinated, and could do without the accompanying homemade spinach mantou anytime. 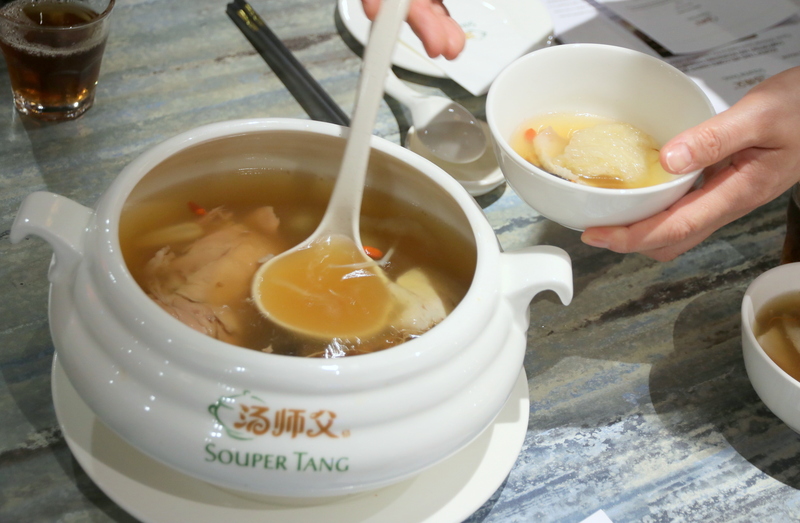 The Stewed Chicken is served with a bottle of Souper Tang’s own Essence of Chicken, where we get to pour it over the chicken. Both these two dishes, together with the mee suah and soups, makes for a perfect dinner any day. We also had a go at their Signature Souper Pesto Pot ($25.90 for 2-3 pax), but this dish didn’t quite work for me despite my liking for steamboat. The soup tasted too “green” for me with a strong pesto flavour, and is definitely not something I will have again – unless you are working on a eat-clean diet, probably ideal to skip this. To my surprise, one of our favourites of the meal at Souper Tang turned out to be the dessert. This Caramel Beancurd ($3.50) reminds me of the once popular Lao Ban Beancurd, but done more refined and with a less sweet taste. While it comes with either the caramel sauce or caramel ginger sauce, I didn’t bother with these condiments at all since the beancurd was already good on its own. Rants The restaurant is open concept, and next to the escalators, so be prepared to get that curious stares from shoppers eager to peer into your food. Will I Return Again? Growing up having soup served at my dinner table has made soup a very integral part of a wholesome meal for me. Souper Tang serves up herbal soups without that bitter taste and can be accompanied by a couple of good mains selections anytime to complete the meal. Will be back again, I am very sure. Make your reservation instantly at Souper Tang here.